Teck: [after hurling Jiale's Tamagotchi out of car] Damn chicken. Q: What does the title "Ilo Ilo" mean? A sensitive, closely observed and well crafted film! Ilo Ilo tells a deceptively simple story with a lot of care and heart.The film is roughly set in the middle of the Asian financial crisis which also affected this small island nation.It tells of a friendship which grows between a young and rebellious boy who has just lost his beloved grandfather and his maid who arrives from Philippines to help his pregnant mother with her hectic schedule. The boys father loses his job and his mother juggles the tantrums of the brat and the increasing demands of her job which she needs to retain at all cost. Ilo Ilo demonstrates that the role of a nanny and domestic servant is very special.The tightrope that both employer and employee walk in balancing "you are a paid servant" and " you are a part of the family" can be so tight and the casualties so subtle that we don't notice the injuries until much later.In a dramatic scene, the school bully teases Jialer that his maid does not actually love him, she is just doing a job for which she is paid.This infuriates Jailer who lunges at the bully in a fit of rage. The director says the film was based on his personal experiences and how he felt that its very cruel for parents to allow maids to become like surrogate mothers and suddenly sack the maid for some reason.This can be a huge emotional trauma for the child who is unable to appreciate the reasons.While the film does not indict the system of foreign domestic helpers, it frames its argument for considering the human cost involved in a gentle way. The character of Teresa reminds us that those of us who were raised by nannies owe so much to them, and we often never acknowledge the debt fully.I completely admired the performance by Yan Yan Yeo who played Jailan's mother as the slightly humorless but ultimately kind woman.She navigates the role with the responsibility that the character must have felt, with her world crumbling around her in trying circumstances. Her performance is pitch perfect and I was amazed to know that her character was not conceived as being pregnant but after she was cast she became pregnant.She managed to convince the director to rewrite the role.Angela Bayani as the diminutive maid Teresa also delivers a stellar performance in a role that requires her to be vulnerable, strong, emotional, stoic and pragmatic at different points.Her chemistry with Jialer played by a very natural Koh Jia Ler is excellent and completely believable. The beauty of this film emerges when we juxtapose its sombre sepia images with the glitz and glamour of present day Singapore.Needless to say the intimate and de-glamorized cinematography by French lensman Benoit Soler plays a big role in creating this magic.The humour is one of the strengths of the film and although I may not have understood all the jokes about growing up in Singapore, going by the reaction of the audience Mr Chen has been successful in his efforts.Yes I did go in with very high expectations and the film did not meet all of them but that should not take anything away from this sweet and intimate film.The quality of the craft is impeccable and there are no rough edges in the film which is remarkable for a debutant director. I recently saw another period Singapore film – That Girl in Pinafore, which although not as elegant as Ilo Ilo tells an equally touching and boisterous tale of a group of teens being typical teens against the backdrop in xinyao music.These are the only two Singaporean films I have seen so far, but we foreigners who live in Singapore need to discover Singaporean cinema, which offers a window into its unique culture. Anthony Chen is the new poster boy of the fledgling film industry of Singapore after winning the Camera d'or at Cannes this year.This is his first full length feature after making eight highly acclaimed short films. 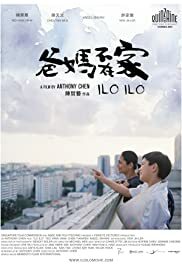 Ilo Ilo is certainly a glittering debut film and hopefully the first in a long and interesting career.It may be Singapore's first Cannes winner but there must have been better films which have not garnered this kind of limelight.One hopes that Ilo Ilo is a watershed moment in Singapore cinema.